(1955-2017) Ahmoo Angeconeb was educated at Lakehead University and York University in Canada. His work has been widely exhibited in Europe including in solo exhibits in Cologne, Berlin, Munich, Monaco, Paris, Basel as well as in North America in Sante Fe, Seattle, Toronto, Halifax, London, and Vancouver. Ahmoo’s Prayer, a 2009 exhibit at The Thunder Bay Art Gallery in Ontario was sponsored by the Ontario Arts Council and the Canadian Council for the Arts. Angeconeb made drawings and print works (often in color on dark paper creating a chiaroscuro effect) that result in bold and dynamic images. Known for his use of Anishinaabe iconography, Ahmoo told personal and spiritual stories arising from figures and symbols his people have used for a thousand years. His 2009 series and exhibit Ahmoo’s Prayer, was offered as a “restorative vision” for healing as the artist struggled with his health. Imbedded in the images are family history and biography. Frequently used figures include thunderbirds and water spirits and radiating “peckings” to indicate smoke used to purify in ceremonies. The “wide-eyed” humans central to these works are a new and particular innovation specific to Ahmoo’s creations. 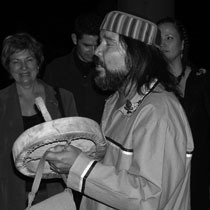 Ahmoo Angeconeb’s artwork has been exhibited at Thunder Bay Art Gallery in 1987, 2000-2001, and 2009. His work has been acquired by the Canada Council Art Bank, the Indian Art Center at Indian and Northern Affairs Canada, among others public and private collections.